Kenneth (ReqPro) Pedersen and I are mashing our heads together on a few game ideas. This is the first one to come together. 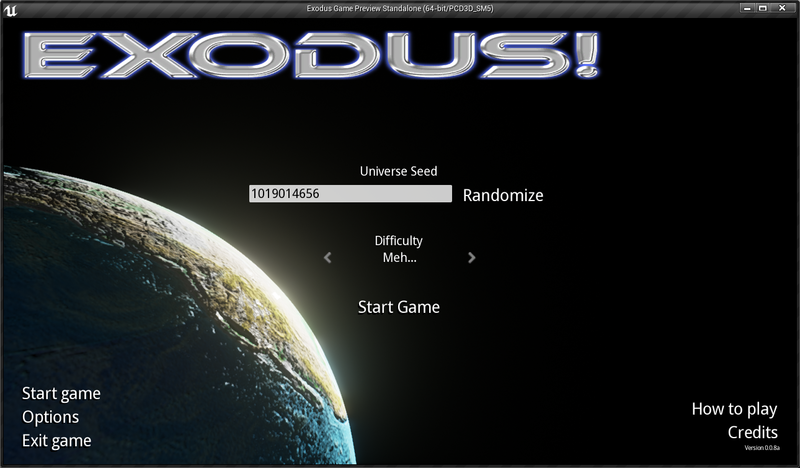 In Exodus! you play the manager of all manager for the last of humanity. Your people have come down to the last of your resources and need to find another place to live. The good news is, you have found 20 planets in the near viscinity to move to, the bad news, your targeting capabilities are screwed up and the population of your home world is impatient. your goal is to adjust the populations of these planets to ensure they are able to live as long as possible, while consuming all of the resources at hand. 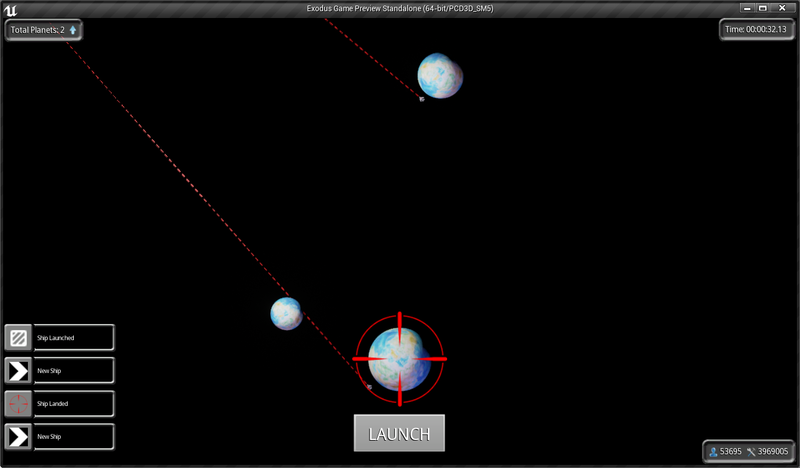 The game starts with you looking down on your home world, and soon after the game starts a ship is launched into orbit. You have about 2 minutes, about the time it takes for your ship to orbit 3 times, to hit the launch button and send the crew on their merry way. If you do not launch within that 120s the crew is lost to friction with the atmosphere and will burn up with lots of screaming =( Woe is me! The ship will exhaust its fuel reserves and then coast until it either a) finds a planet, at which point the crew attempt to colonize it, or b) finds deep space at which time they die. =( Oh noes! When a planet has exhausted its resources, and population, it will become a barren wasteland and any ships that attempt to land there will have to stay in orbit. This ship has one half of an orbit to find a new home. =( Man, its tough out there in space. Last edited by Bob_Gneu; 08-02-2014, 01:51 AM. Reason: Now with 100% more download links. UI Updates + Graphical improvments. Planets are now gravity sources! Difficulty is now a configuration object - More on this later! Level Seed is now exposed via the config file. Addressed infinite loop when creating the universe layout. Orbits now begin and end with variation on length and initial offset. The end of the game is now properly captured and will return you to the main menu to play again if you choose. MOST OF ALL - We are now using physics for the motion of the ships when moving around in the universe. Properly worked out issue with resources and population. Launch ship with Space and Launch button interaction. The camera can actually move now o.O and zoom! Let's not forget the zoom! This week ReqPro and I spent our time trying to iron out the gameplay and smoothing out the experience. 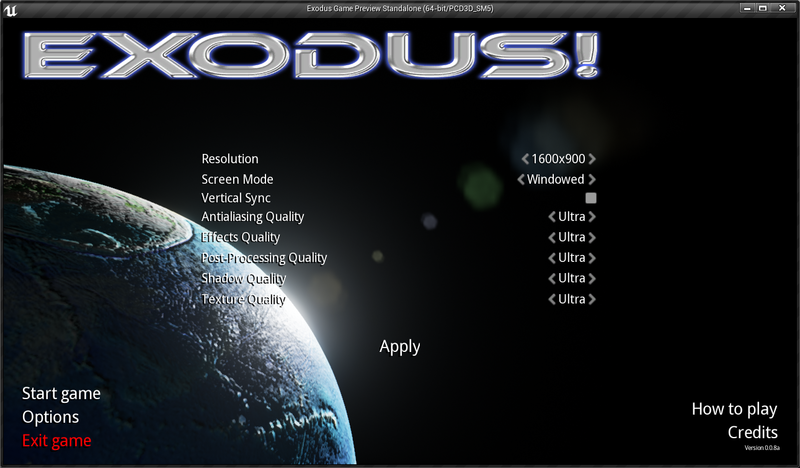 We are getting very close to a release-worthy title, so get your world managing gloves on and get ready to play Exodus. Colonists recently figured out what it means to consume resources, and have to deal with what happens when they consume everything. Suffice to say, its not good - lots of death results. - OH NOES!?! Really, this game is a starting off point for ReqPro and I to get used to the engine and expand our experience. We now have Slate, the organization of code and some interesting collaboration issues addressed. Lets hope that as things go forward move games will be released to show off our abilities and prove to you all that although we made a world managing game we aren't exactly gods - we just play them on T.V. A week later and 3 more alpha builds in, We are now entering a polish stage. Its time to clean up and optimize our algorithms and to replace the assets with our own. Key highlights with this build - Main Menu is coming together & resource and population growth are now ticking around with the rest of our elements. Exodus is nearly upon us all. Thank you for the input. We strive to be better at our jobs, so please review the ones above. Also - the best screenshots are the ones from the live game. Go ahead and grab the download (Yes, a UE4 title for an investment of 38.8M). Last edited by Bob_Gneu; 04-15-2014, 10:19 PM. I am really enjoying your writing style in the original post! It is so uniquely.... You ! Keep on writing just as you want to do, it's great! I look forward to seeing how this project comes along! This has been another great dev session. Ken has tamed the beast that is Slate, and unearthed some really amazing bugs. I have been hard at work sanding the edges down and improving the experience. All and all im pretty happy with the latest build. I'll try to record a couple samples to show off the new motion that will make Newton happy. This last week has been stressful to the max, but it has paid off in spades. Slate is nearly tamed, so we took to overhauling the UI to be more professional, while adding in more programmer art! The other grand event that has occurred is that gravity is now being calculated for each planet in the universe - which has made the game into a very different beast. Although we are looking at tweaking it further, there are no more major issues ahead. Alright folks, we are coming down to the end. Exodus is having its final touches tacked on and the some last minute tweaking of the values. Thanks to those of you who have played it thus far. The next release will be an official release. Does anyone want to write a haiku to celebrate saving the human race? By final touches, we mean tons more programmer Art + Sound Effects. Alrighty. We have shelved a number of tweaks so we can get to work on the next project, and will likely have a patch fix in the next few weeks. Please grab the game and go to town! We need and welcome all forms of feedback so don't be shy. I was looking at this thread again and realized you had a greenlight page also. Just from watching the video on your steampage it is not immediately clear what the goal of the game is, or the challenge, or the gameplay. To be honest i cant really figure it out when reading the text, which is, admittedly, still very amusing to read. From what i can tell you can select a planet which is colonized and send off its exodees by launching them tangentially off the planet, straight into other ones. It doesn't seem all that difficult, especially with the help line which shows the actual trajectory. I think it would need to extend it's mechanics to make it interesting enough to warrant buying it. --if it is not habitable, you need to send terraforming drones or something, which takes time to transform the planet, all the while your other planets die. -The universe could be covered in some kind of fog of war, where you have to sent drone scoutes to actually find planets in the first place. --planets would be orbiting around a star aswell, making it more challenging to find and land probes, satellites and colony ships. -environmental effects on the planets (seeing them whither away by pollution etc.) this is ue4 after all, make use of its mighty materials. Also great for feedback how urgent people need to recolonize. 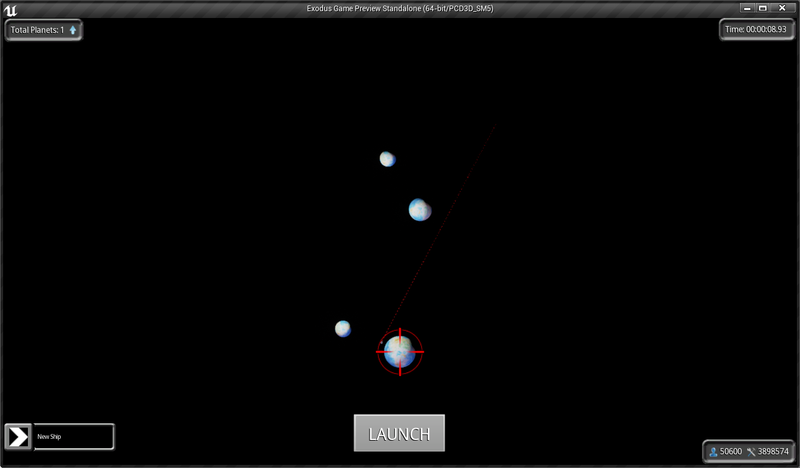 -Non fixed playfield: instead of randomly placed planets, have randomly created systems. i.e. start on our actual solar system, on earth, and try to find a new planet, swinging from one to another, trying to exit our solar system to find new habitable ones in another system. On the art side of things, if there is one, there's a lot of work to be done, i'm sure you realized. Ui design is barely there. Theres no feeling of space, only blackness (yeah it might be accurate but it looks dull). Add some nebulae, starfield, milkyways etc to the background. Planets look hideous, and all the same, which makes for a very bland look and the colony ships look like airplanes. I believe it could feel very much like a small scale RTS where you fight against yourself, destroying everything you inhabit while searching for new planets to colonize and ultimately destroy, all for the search of the one planet, eden (or whatever :P). It could very well include some roguelite elements, some of which it already does, and create a truly unique and fun casual experience. Hey there and thanks for the constructive criticism! It's always great to hear what we can improve and getting ideas on what to put into the game. 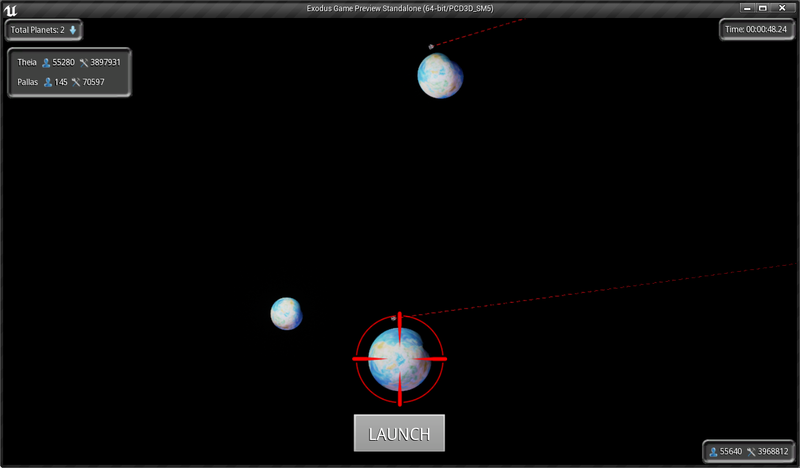 As you correctly assumed, the game is incredibly simple, nothing to break your brain in there - EXCEPT: the difficulty; Since a launched ship of exodees can only orbit a certain period of time before the ship burns up in the atmosphere due to fuel loss or what have you, it quickly turns very chaotic once you have several planets colonized - it becomes a juggling match to keep ships moving between planets without accidentally firing them off into deep space and before their orbit time runs out. Now, your suggestions are pretty great and definitely not something I'll reject off the bat, and to be quite honest, some of it we have already discussed putting in. The reason this game is so bare-bones at this point is because we wanted to throw out a prototype to gauge interest before we invest a whole lot more time into it. We had also discussed a star field shader in the background, being completely procedural and all some such wonderful stuff, making use of some of Unreal Engine's incredible features - again, if interest is high enough for this game, Bob and I will definitely be expanding it and polishing it to its full potential. Your suggestion about changing materials as the planets are slowly consumed was on the drawing board as well, but again, we decided not to put too much time into the game if the interest turned up to be nigh zero, I hope that makes sense. Finally, please don't apologize for being harsh - your criticism was very constructive and extremely helpful, not to mention very politely written - we're grateful for the input as it will definitely help us make a better game. Last edited by ReqPro; 05-28-2014, 08:39 AM.